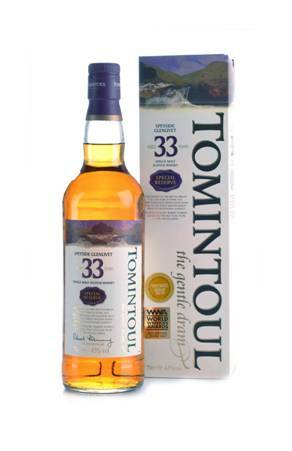 Multi-award winning Tomintoul Speyside Glenlivet Single Malt Scotch Whisky Aged 33 Years has been lovingly crafted, from a selection of very special bourbon casks, each aged for at least thirty-three years. Comments: "Improbably juicy delivery. Whisky marmalade and figs melt in with the sweetened vanilla and intense barley. Long (finish) with barley-thickened molasses. A hint of kumquat at the death."